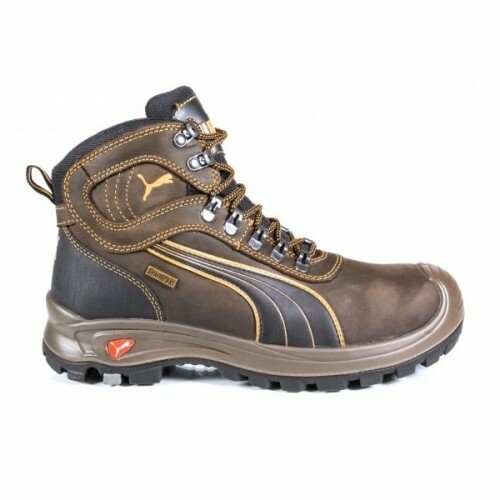 The Puma Sierra Nevada Composite Toe Boot is a safe and extremely comfortable boot. The boot offers you a durable and tough leather upper with a waterproof seal to keep your feet dry while you work. This boot has a composite toe cap to protect your toes from injury while you are working, as well as a toe bumper guard to help reduce abrasion to your boots. The outsole is also heat and slip resistant whilst maintaining a high comfort level. These boots are built with the comfort of a running shoe and the safety of a durable work boot; a true modern workboot.